The typical modern tennis racket has a light-weight, hollow graphite frame with a large head. Though these rackets are easier to swing, there seems to be an increase in the number of players experiencing injuries commonly known as “tennis elbow”. Recently, even notable professional players such as Rafael Nadal, Victoria Azarenka, and Novak Djokovic have withdrawn from tournaments because of wrist, elbow or shoulder injuries. A recent new solid foam-filled graphite racket design claims to reduce the risk of injury. Previous testing has suggested that these foam-filled rackets are less stiff and damp the vibrations more than hollow rackets, thus reducing the risk of injury and shock delivered to the arm of the player . Figure 1 shows cross-sections of the handles of hollow and foam-filled versions of the same model racket. The preliminary study reported in this paper was an attempt to identify the vibrational characteristics that might explain why foam-filled rackets improve feel and reduce risk of injury. Figure 1: Cross-section of the handle of a foam-filled racket (left) and a hollow racket (right). The first vibrational characteristic we set out to identify was the damping associated with first few bending and torsional vibrations of the racket frame. A higher damping rate means the unwanted vibration dies away faster and results in a less painful vibration delivered to the hand, wrist, and arm. Previous research on handheld sports equipment (baseball and softball bats and field hockey sticks) has demonstrated that bats and sticks with higher damping feel better and minimize painful sting [2,3,4]. 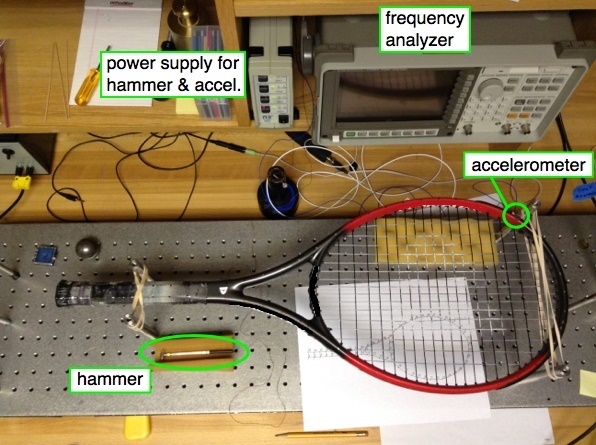 We measured the damping rates of 20 different tennis rackets, by suspending the racket from the handle with rubber bands, striking the racket frame in the head region, and measuring the resulting vibration at the handle using an accelerometer. Damping rates were obtained from the frequency response of the racket using a frequency analyzer. We note that suspending the racket from rubber bands is a free boundary condition, but other research has shown that this free boundary condition more closely reproduces the vibrational behavior of a hand-held racket than does a clamped-handle condition [5,6]. 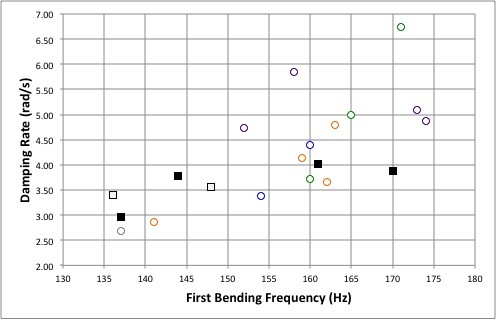 Measured damping rates for the first bending mode, shown in Fig. 2, indicate no difference between the damping and decay rates for hollow and foam-filled graphite rackets. Similar results were obtained for other bending and torsional modes. This result suggests that the benefit of or preference for foam-filled rackets is not due to a higher damping that could cause unwanted vibrations to decay more quickly. Figure 2: Damping rates of the first bending mode for 20 rackets, hollow (open circles) and foam-filled (solid squares). A higher damping rate means the vibration will have a lower amplitude and will decay more quickly. Experimental modal analysis is a common method to determine how the racket vibrates with various mode shapes at its resonance frequencies . In this experiment, two rackets were tested, a hollow and a foam-filled racket of the same make and model. Both rackets were freely suspended by rubber bands, as shown in Fig. 3. An accelerometer, fixed at one location, measured the vibrational response to a force hammer impact at each of approximately 180 locations around the frame and strings of the racket. The resulting Frequency Response Functions for each impact location were post-processed with a modal analysis software to extract vibrational mode shapes and resonance frequencies. An example of the vibrational mode shapes for hollow graphite tennis racket may be found on Dr. Russell’s website. Figure 3: Modal analysis set up for a freely suspended racket. Figure 4 compares the first and third bending modes and the first torsional mode for a hollow and foam-filled racket. The only difference between the two rackets is that one was hollow and the other was foam-filled. In the figure, the pink and green regions represent motion in opposite directions, and the white regions indicate regions, called nodes, where no vibration occurs. The sweet spot of a tennis racket is often identified as being at the center of the nodal line of the first bending mode shape in the head region . An impact from an incoming ball at this location results in zero vibration at the handle, and therefore a better “feel” for the player. The data in Fig. 4 shows that there are very few differences between the mode shapes of the hollow and foam-filled rackets. The frequencies at which the mode shapes for the foam-filled rackets occur are slightly higher than those of the hollow rackets, but the difference in shapes are negligible between the two types. Figure 4: Contour maps representing the out-of-plane vibration amplitude for the first bending (left), first torsional (middle), and third bending (right) modes for a hollow (top) and a foam-filled racket (bottom) of the same make and model. This preliminary study shows that damping rates for this particular design of foam-filled rackets are not higher than those of hollow rackets. The modal analysis gives a closer, yet non-conclusive, look at the intrinsic properties of the hollow and foam-filled rackets. The benefit of using this racket design is perhaps related to a larger impact shock, but additional testing is needed to discover this conjecture. Ferrara, L., & Cohen, A. (2013). A mechanical study on tennis racquets to investigate design factors that contribute to reduced stress and improved vibrational dampening. Procedia Engineering, 60, 397-402. Russell D.A. (2012). Vibration damping mechanisms for the reduction of sting in baseball bats. In 164th meeting of the Acoustical Society of America, Kansas City, MO, Oct 22-26. Journal of Acoustical Society of America, 132(3) Pt.2, 1893. Russell, D.A. (2012). Flexural vibration and the perception of sting in hand-held sports implements. In Proceedings of InterNoise 2012, August 19-22, New York City, NY. baseball bats. In Proceedings 6th IOMAC Conference, 1, 11-16. Banwell, G.H., Roberts, J.R., & Halkon, B.J. (2014). Understanding the dynamics behavior of a tennis racket under play conditions. Experimental Mechanics, 54, 527-537. Kotze, J., Mitchell, S.R., & Rothberg, S.J. (2000).The role of the racket in high-speed tennis serves. Sports Engineering, 3, 67-84. Schwarz, B.J., & Richardson, M.H. (1999). Experimental modal analysis. CSI Reliability Week, 35(1), 1-12. Cross, R. (2004). Center of percussion of hand-held implements. American Journal of Physics, 72, 622-630.